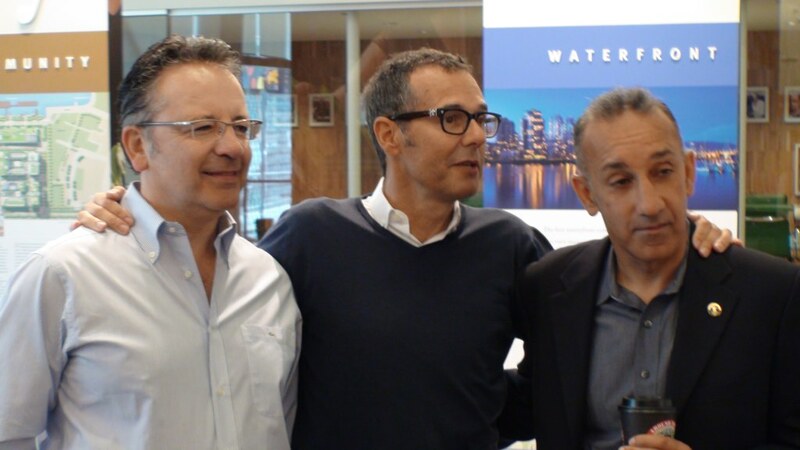 Bob Rennie stands with the Maleks, developers of the Olympic Village. 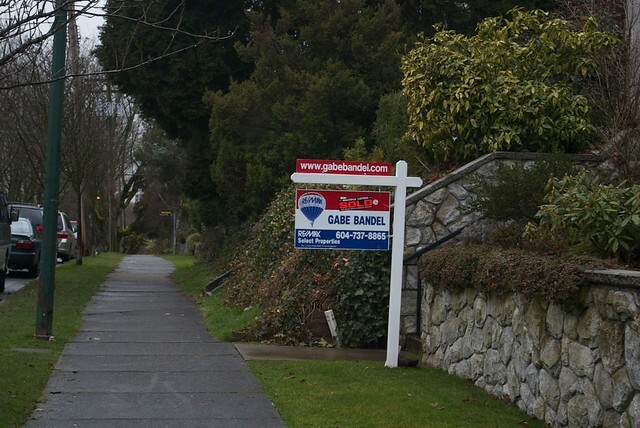 This past Friday afternoon it was announced that real-estate tycoon Bob Rennie and former public servant Judy Rogers would be appointed as Commissioners of BC Housing. Some journalists noted that the appointment of Rennie was patronage for his support of Christy Clark in her leadership bid. Since the early rise of John Cummins and the B.C. Conservatives, Rennie has also been a proponent of a united right wing. He has contributed heavily to BC Liberal campaigns and often boasts of maintaining close contact with Rich Coleman and other higher ups in the current government. The appointment of Judy Rogers also appears to be patronage for her mishandling of the Olympic Village project. It was under her oversight that the intended investment in social housing became instead a luxury development. 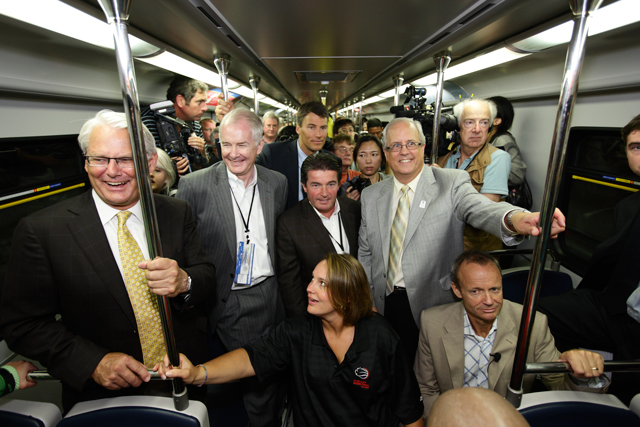 Under her leadership as former City Manager, the developer Millennium was selected for the project, and for all practical purposes given free reign to access city finances. While for most Vancouverites this has been a catastrophe, it would be disingenuous to say it wasn’t what the higher ups in the BC Liberal party wanted the whole time. Yesterday, the Mayor’s Developer Task Force released its interim report. On the surface, the four page pamphlet does not provide anything new, containing only the standard free market jargon and housing bubble diagrams we have seen for the last three years. As former planner Brent Toderian has recently stated, the plan regurgitates much of what the City has already proposed. Instead of proven solutions, there will be only market solutions to housing affordability built by for-profit housing developers. The same mechanisms that gave us a housing crisis in the first place will now be used to address it. The report is clear that those who need housing the most will be left out of the mandate of the task force: the task force will only be looking at how to build housing for people with incomes above $21,500. It is claimed that individuals who make less than this amount will have their housing needs addressed by the City’s Housing and Homelessness Plan. The Housing and Homelessness Plan calls for the construction of 38,000 units of housing — 20,000 of these condos — over the next ten years. This amounts to 3,800 units, in other words, less housing than the 4,000 or more units that have been built annually for the past decade. Vancouver’s civic election on Saturday has brought us a new City Council. But as the five million dollar campaign fades, we should take a look at what this ‘new’ council wants to do. By electing Gregor Robertson and the Vision slate, voters have decided to stay the course on a path started in 2008 — but what exactly is the course? Though progressives might feel relieved for keeping out an NPA majority, we must remember that Vision has and will implement neo-liberal policies — many of them NPA policies from the 2005 – 2008 term under Sam Sullivan. Residents will have to mobilize against council, or else get more of the same. Over the past three years we saw the donning of Vancouver as the City with the lowest businesses taxes in the world, matching an increase, not a decrease in homelessness, and an almost 20% increase in housing prices last year alone. These losses can be weighed against the positive implementation of the unjustly controversial backyard chicken coops, bike lanes, and food carts. While we will be safe from the NPA’s street-car, we will most certainly not be safe from Vision’s land-use policy predicated on eviction and demolition of affordable housing. To create the illusion of democracy and choice, NPA and Vision will have to chose a set of wedge issues, which will redirect the discussion of civic politics away from issues onto superficial gossip and ruling-class infighting. Differentiation will have to take place in lieu of actual difference. Over the past three years, we’ve seen the two developer parties focus on personal smears, bike lanes, $1,000 environmental projects, or most recently, the street-car. Many progressives stand with Vision on these issues, but they are only a distraction from the municipal government’s main purpose, which is to regulate land-use and facilitate affordability. We will also see large condo towers popping up throughout East Vancouver, justified as part and parcel of the NPA’s EcoDensity program, which Vision Vancouver has adopted since 2008. Massive developments in low-income neighbourhoods are the most profitable form of real-estate development, and are therefore the most desired by developers. In anticipation of this gentrification, shops will raise their rents and evict long-time businesses. 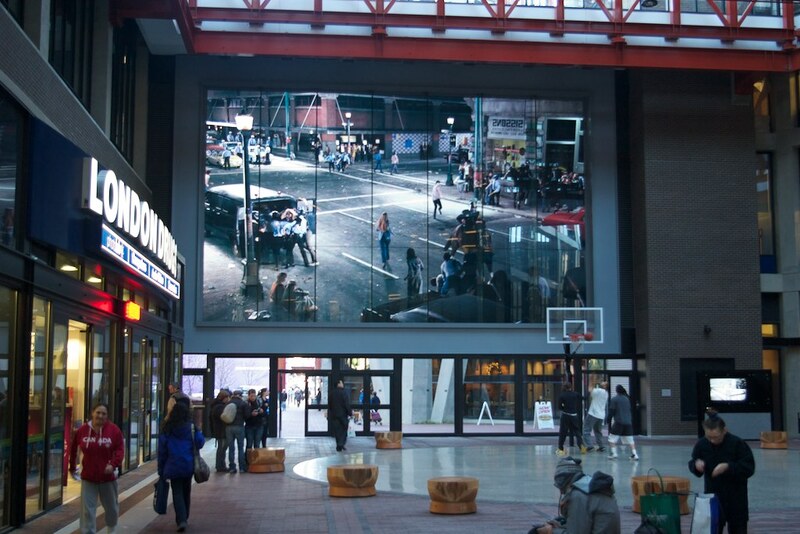 This can already be seen on Main Street, along Kingsway, in the Downtown Eastside, and elsewhere. 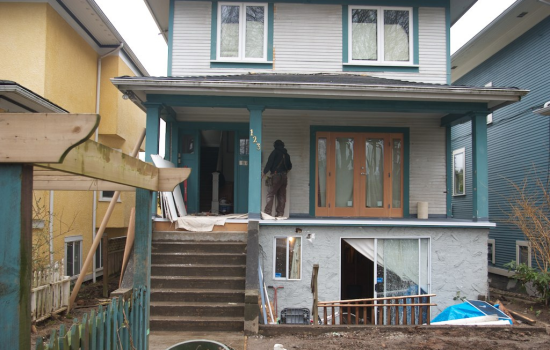 Gregor Robertson and Vision Vancouver have said on several occasions that they are unable to stop evictions. But the truth is that they do not want to stop them, because their housing policy is literally dependent upon evictions. To build affordable housing without subsidizing it, you need to evict low-income tenants — that is the only way. Vancouver has “rate-of-change” bylaws that prevent conversion of rental to condominiums, but do not prevent conversion from low-income rental to medium or high-income rental. Vancouver has created its own portmanteau for this ongoing process: the ‘renoviction.’ This is the simple process of landlords evicting tenants to increase rents further than inflation-plus-2%. 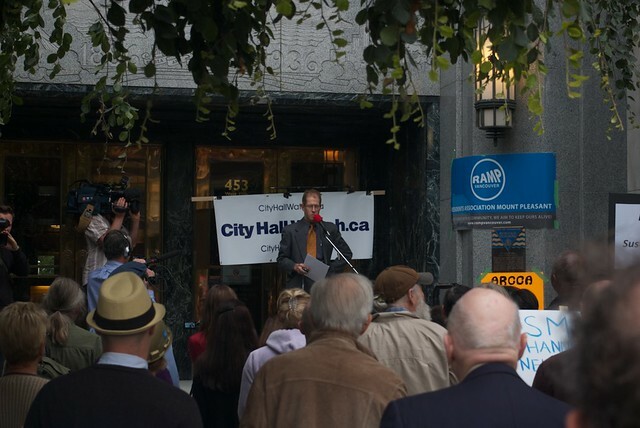 The Mainlander’s Sean Antrim sat down with their Mayoral candidate Randy Helten of Neighbourhoods for a Sustainable Vancouver (NSV) to talk about affordability, accountability, the arts, and Vancouver’s future. It is a tall order for a political party that does not receive corporate and developer donations to get candidates elected. NSV has been fighting an up-hill battle. 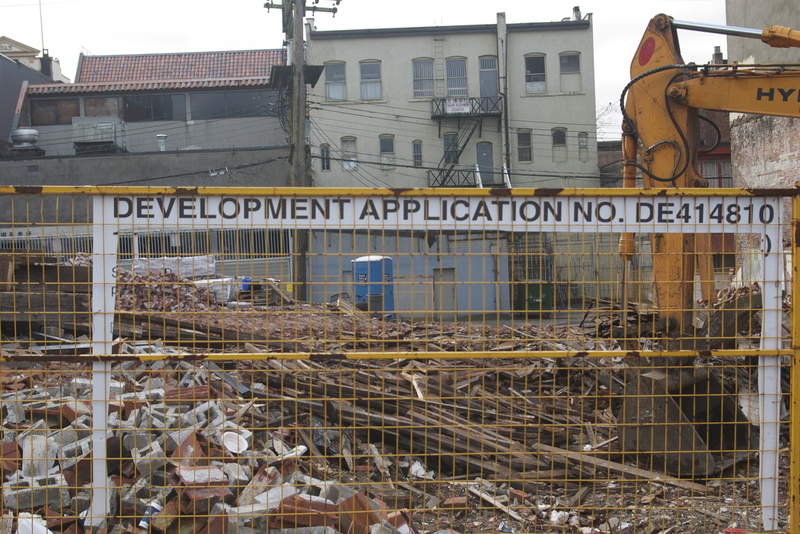 Sean Antrim: What amount of development do we need in Vancouver right now? And the reason that I’m asking this question is because many people, and the mainstream press, have criticized Neighbourhoods for a Sustainable Vancouver as being NIMBY-based. A lot of journalists have been around for a while, and in the 1990s with Gordon Campbell, NIMBY-ism was quite a problem. Randy Helten: To tell you the truth, I don’t know the answer. In fact, I don’t think anyone knows the answer. The people who know the answer are concealing the answer. Because the City has removed from public access numbers that show the current zoning capacity. It used to be up and available, but it’s gone now. My understanding is that Professor Patrick Condon at UBC has done some studies, and he’s saying that for construction within the current zoning, the capacity for additional population density is enough for decades into the future. Construction could happen without any rezoning, to fill all of the incoming population. The City has these numbers, and in January of this year [COPE Councilor] Ellen Woodsworth put forward a motion that was passed, according to which the planning department was supposed to release the numbers of zoning capacity to council some time in February. It’s off the map. Despite repeated requests there’s been no response out of the planning department. So no one knows the answer publicly. The information is concealed. My suspicion is that if you take the West End, for example, I think in the current zoning, without rezoning, we could accommodate another 5,000 people or so. That’s just a sense, because I know the areas that are zoned right now for six stories that are currently two stories. If you take the average of all that and you look at a long term thirty-year plan or a hundred-year plan, and look at the land area in the West End and long term population goals — steady growth, not too extreme, not too rapid — the West End could accommodate several thousand more people. Sean Antrim: That’s the way most cities do rezoning — blanket rezoning — which is doing an entire neighbourhood at a time. Why do you think we have so many spot rezonings in Vancouver? Randy Helten: My understanding of the dynamics is that a spot rezoning allows exceptions to happen within the existing zoning. In many cases it offers huge returns to the owner of those specific spots. If you go to the old adage “follow the money” and look at who’s making campaign contributions to our elected officials, it makes sense. They’re making the campaign contributions, the officials get into power, and they have control over land use decisions. They’re supposed to regulate the land on behalf of the entire public and balance all the interests of all of the stakeholders. Both Vision and the NPA as organizations are incapable of avoiding undue influence from that private money, and that’s what we’re seeing as the results of their decisions.